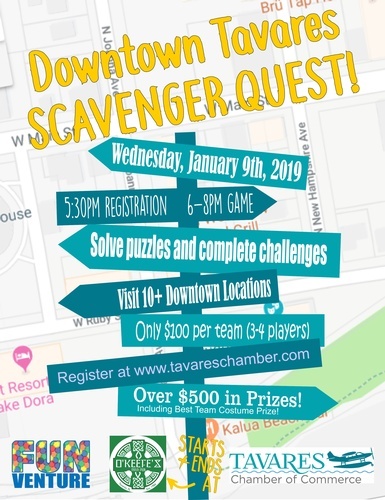 The Downtown Tavares Scavenger Quest is a team event that allows teams of 3-5 persons the opportunity to visit downtown merchants, play games, gather clues, take pictures, and score points to win prizes. Team Packet pickup begins at 5:30pm at O'Keefe's Irish Pub and Restaurant, 115 S. Rockingham Ave in Tavares. Instructions from the Game Master starts at 6:00pm then play will begin shortly, lasting for 2 hours. There will also be an after party at O'Keefe's, beginning shortly after 8:00pm. Team registration is only $100 and this includes a drink token, all gaming materials, and fun activities. Proceeds from the event will benefit the Tavares Chamber of Commerce. Participating businesses are limited to Chamber Members only. The Scavenger Quest is open to players of all ages.